My current take-along project is a pair of socks for myself. 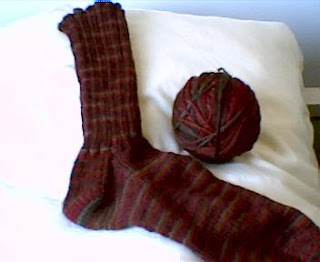 I'm using Knit Picks' Sock Memories in the Redwood Forest color way. One sock is done, and I'll start the second one soon. I've never understood Second Sock Syndrome. But I love making socks, so the prospect of knitting a second one is always welcome. I'm off to a good start on my linen market bag. 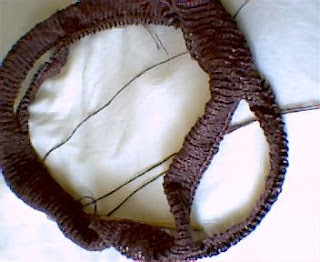 I'm almost done with the upper band and ready to start the mesh for the body. The band is knit on size 4 needles, so it's taking longer than I anticipated. The mesh will be knit on size 13s, however, so that should speed things up. I'm very anxious to finish this so I can use it at the farmers' markets.